16 Kms. from Airport, 4 Kms. from Railway Station. Hotel Tulip Aruna is situated in the downtown Nungambakkam district of Chennai. 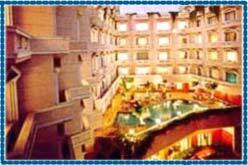 Tulip Aruna Hotel is considered as one of the finest hotels of South India. This have been proved by the vast numbers of awards that have been won by the hotel in the past. Hotel offer complete value for money for its guests with services comparable to any of the five star hotels available in Chennai. Hotel offers its guests with 91 rooms that have been decorated and designed to provide guests with the best of comforts. All the rooms have been carefully designed keeping in mind that the business and leisure travellers can both stay at the hotel. Room safe, Hair dryer, Refrigerator, Mini bar, Safe deposit, Channel music, Tea/coffee maker, Business centre, Banquet & conference facilities, Doctor on call, In-house laundry, Valet services, Money changer, Internet connection.